Mr and Mrs Hargraves, along with their son and daughter, are not the strongest specimens of the human race so they naturally hope the newest addition to the family will prove to be more robust. After the baby is born, however, Mrs Hargraves has great difficulty feeding it and finding any sort of food that it likes. One day poor Mrs Hargraves is at her wits’ end and bursts into tears, but her son and daughter notice an avocado pear in the fruit bowl and suggest their mother feed it to their baby brother. The mystery is that nobody knows how the avocado got there, as the Hargraves certainly hadn’t bought it. In her desperation, however, Mrs Hargraves cuts it in half, mashes it up and feeds it to the baby. Since he eats it all, Mrs Hargraves continues to give him an avocado pear every day. The baby soon becomes so strong that he is able to break out of his high chair and pull a cartload of children up a hill. One night everyone is fast asleep but the baby hears a burglar in the house; he gets hold of a broom and chases the terrified burglar away. After that the baby helps with carrying shopping, moving furniture and pushing the family car with everyone in it. The baby is thankfully able to deal with two bullies who attack his brother and sister while they are walking him in the park. The baby simply picks them up and throws them into the pond. The story ends with a picture of the baby having a rest in his carry-cot and the news that he continues to get stronger eating avocado pears. John Burningham’s stories are inclined to be rather unusual, and Avocado Baby does seem a little strange as a young children’s book. There is, however, quite a bit a humour in the story, and young children will doubtless be delighted by the idea of a baby moving a piano or picking up a bully in each hand. Parents who have had problems feeding their children will appreciate Mrs Hargraves’ desperation as well as her relief when her baby wolfs down that first avocado pear and then starts to become stronger by the day. It is good to see the older siblings playing their part too, and of course being protected by the astonishing baby. Burningham illustrates all his picture books himself, and all except one of the pictures here are in full colour. The backgrounds are usually white, so there is no difficulty with reading the text. The colours used are bright and varied which I think is important in a young children’s book. One page, where Mrs Hargraves is shown trying to feed the baby, is set out like a comic strip with a series of pictures. We see the baby angrily pushing the plate away, as well as Mrs Hargraves attempting to feed him in the bath and while he is standing up in his cot. She is at her wits’ end and will try anything. This is a page with no text that could generate discussions about the various scenarios, considering the feeding problem from both the baby’s and the mother’s point of view. Favourite illustrations are likely to be the full-page one of the burglar dropping his swag bag when he sees the baby brandishing a broom behind him, or the double-page spread of the two bullies landing in the pond with an almighty splash that disturbs the poor ducks and a fish. The endpapers at both the front and back of the book show a double-page spread of an avocado plant covered with miniature babies in various colourful outfits. Some are perched on leaves while others appear to be performing gymnastics. This is a delightful illustration and again could be an inspiration for a conversation about what the babies are doing. The text is in an unusually large and clear font and is always on a white background. There are never more than eight lines on a single page, usually less, and sometimes the text is broken up into smaller sections with illustrations in between. This is of course a book that is intended to be read aloud to very young children, but because of the clarity and the lack of long passages of text, it might also be suitable for young independent readers. I didn’t feel that ‘Avocado Baby‘ is such an outstanding book as John Burningham’s ‘Cloudland’, either visually or in terms of the story. The ending of ‘Avocado Baby‘ is perhaps a bit of an anticlimax, as we are simply told that things carried on as they were. I would, however, definitely recommend this as a book to borrow from the library, and Amazon’s current price of £3.94 seems a reasonable one. 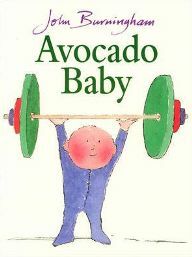 I don’t know if any miraculously strong, avocado-eating babies have come about as a result of having this book read aloud, but I would recommend it as an unusual story that has a fair amount of humour that will appeal to most young children. One Comment on "Avocado Baby"